Every Tuesday Diane at Bibliophile by the Sea posted the first paragraph of a book she is reading or planning to read. In 2018, Vicki from I'd Rather Be at the Beach is taking over this meme. "Do you want everyone to hear us? Keep your voice down," Gabe whispered to Parker Carlyle, his best friend since childhood. He scanned the celebrants at his brother Jayce's Christmas Eve wedding reception. No one was paying attention to them -- until his mother looked up. She didn't have paranormal hearing like her sons and husband, but that never stopped her from knowing exactly what was going on. Her smile faded as she took in Gabe's serious expression. Share the title & author, too, so that other TT participants can add the book to their TBR Lists if they like your teasers! Everyone loves Teaser Tuesday. Missy had had it. She was actually glad to get back to work where she could think about something besides disappointing Parker, messing up Gabe's life, and probably messing up her own. Misty Carlisle works as a bank teller in Boston's financial district. She's had more rotten luck in her life than most, except when her childhood crush shows up to cash his paycheck. Then her heart races and her mouth goes dry. 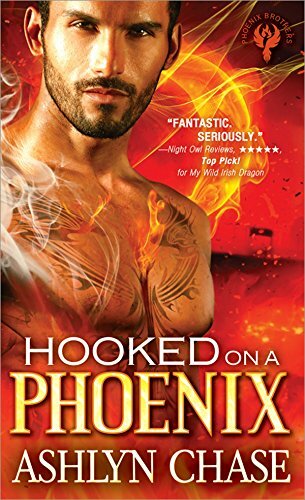 Gabe Fierro is a firefighter—and a phoenix. Like his brothers, his biggest challenge is finding a woman open-minded enough to accept a shapeshifter into her life. When his boyhood friend asks him to watch over his little sister Misty, he reluctantly agrees. But when the bank where she works gets held up, Gabe does everything he can to protect her. The two of them end up locked in the bank's vault...where things get steamier than either of them ever imagined. Not my kind of read, but the title triggered a song in my mind. Now I can't get B.J. Thomas's "Hooked on a Feeling" bout of my head, lol. I love the snippets and the blurb. Enjoy, and thanks for sharing. Thanks for visiting my blog. We moms always have an uncanny knack of knowing what's going on! I would keep reading. That first paragraph has me curious although the cover tells me this isn't my genre. I hope you enjoy it. A phoenix - sounds good! I would definitely want to read this one. Great teaser. I don't normally read paranormal novels but I can definitely appreciate this intro. Not a genre I read but I hope you enjoy it. Yeah, if work keeps life worries away for a while, go for it! Great teaser! Thanks for stopping by! Happy reading!